This has got to be one of my favorite wedding images ever…and one of my most awarded in professional wedding photography competitions. On the local level at PPGNY (Professional Photographers of Greater New York) this image was awarded Best-In-Show in their image competition. On the state level it garnered a Court of Honor award; one of the highest awards attainable) at Photo Northeast, the joint convention of PPSNYS (Professional Photographers of New York State) and PPANJ (Professional Photographer's Association Of New Jersey). Finally, on the international level, this image earned a silver award at The WPPI (Wedding and Portrait Photographers International) 16 X 20 Print, Album and Film Making Competition held annually at the MGM Grand Hotel and Conference Center in Las Vegas, Nevada.Non withstanding to all the awards, this image has special meaning to me. One of the greatest things about this business is the friendships I forge with my clients. The bride in this photograph was the second of two sisters to get married within a year’s time. I had the privilege and pleasure of being the wedding photographer for both these lovely brides and, naturally, got to know the family quite well. The bride’s sister was married at St. Catherine of Sienna R.C. Church in Franklin Square, NY and had her wedding celebration at the famous waterfront catering venue, Marina Del Rey, in Bronx, NY (Under the Throgs Neck Bridge with the New York City skyline as a backdrop). The bride in this photograph chose The Royalton at The Roslyn Country Club in Roslyn Heights, NY to cater her reception. 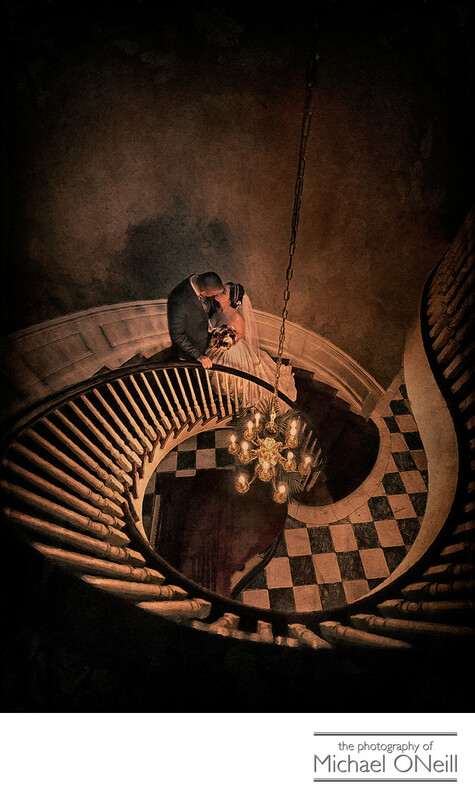 The stairway in the picture rises from the main lobby of the stately old mansion to the upper floor where the bridal suite, replete with it’s own period style bar, is located. Both of these bride’s and the rest of their family are wonderful people and I was honored to have captured all the memories of both days and preserved them in custom designed wedding albums for generations of enjoyment.